Greetings, beloved brethren, and whoever may stumble upon this post. It's already September, and the year has grown old. One day, time itself will end. The Kinsman-Redeemer who bought back the fallen Creation at the cross and holds the title deed to the earth (i.e. the seven-sealed scroll of Revelation 5) will one day take back what is His by right. He shall stand, one foot upon the earth, and one foot upon the sea, swearing by Him that liveth forever and ever "that there shall be time no longer" (Revelation 10:5-6). And, praise God, where there is no longer time, there shall no longer be the bruises, regrets, pains, and woes of time. Measuring life for you and me." To obtain the password and future access to our secure Insider News, follow the instruction HERE. The direction from the Lord and these developments, bearing good out of what some meant for evil (cf. Genesis 50:20), are thereby lovely tokens that fit nicely with September days. I am reminded of a poem penned by Helen Hunt Jackson in the 19th Century. Ms. Jackson labored to help the Native American peoples of the frontier in a time when the United States government was guilty of crimes against them. She decried this maltreatment and lobbied much on the behalf of the Indians. The golden-rod is yellow; The corn is turning brown; The trees in apple orchards, With fruit are bending down. The gentian’s bluest fringes, Are curling in the sun; In dusty pods the milkweed, Its hidden silk has spun. The sedges flaunt their harvest, In every meadow nook; And asters by the brook-side, Make asters in the brook. From dewy lanes at morning, The grapes’ sweet odors rise; At noon the roads all flutter, With yellow butterflies. By all these lovely tokens, September days are here, With summer’s best of weather, And autumn’s best of cheer. But none of all this beauty, Which floods the earth and air Is unto me the secret, Which makes September fair. For us, the lovely tokens of September are our newly focused direction: no longer Jewish Missions as A PRINCIPAL FOCUS alongside public proclamation, mass distribution, and training for local churches; but THE PRINCIPAL FOCUS with mass distribution of the printed Word (i.e. colportage work), public proclamation, and evangelism and missions training falling under the umbrella of this primary objective. The lovely tokens of September are our new ministry Vice-President, our two new Trustees--all of which have a zeal for going to the Jew FIRST and also to the Gentile. And, last but far from least, these lovely tokens include our newly appointed laborers. On September 1st, the FPGM Board of Directors voted to appoint Eric & Mindy Trent to a 14-month term. This young couple initially served together on the original 2015 Team Yeshua. Mindy served again on Team Yeshua the following year. These two got married back in January, and starting November 1st, they will officially begin their term with Full Proof Gospel Ministries. We greatly look forward to seeing the Lord use this young couple in Argentina, Ladakh, and Nepal next year . . . testifying FIRST to the Jewish people, and also to the Gentile nations, repentance toward God and faith in Jesus the Messiah (Acts 20:21). Eric will be traveling with me to South Asia in November for training and so that we can help Brother Bishnu and the Nepali believers from his local church establish a beachhead for reaching the Israeli tourists themselves. Once again, the Lord has filled a great need; and trial more valuable than gold has bought forth blessings far beyond what we could have ever anticipated. I marvel at the Divine Hand of Providence. Please pray for Eric & Mindy Trent and for the work of Full Proof Gospel Ministries. This is a huge step of faith for them and for us. These will need the spiritual prayer cover of the saints and the financial support of God's people. By these lovely tokens, September days are here. With summer's best of weather, And autumn's best of cheer. For us, the summer's best of weather is the great success that was Team Yeshua 2017 in Peru. Autumn's best of cheer is what is coming as a result of that work. More than ever, your prayers and support are needed and much appreciated. Autumn's best of cheer on the ministry front, Lord willing, will involve a 6,000-mile colportage venture and another South Asia journey, the focus being "to the Jew first and also to the Greek" (Romans 1:16). We have a large shipment of Hebrew/English and Hebrew/Spanish Bibles on its way, and I need to make room for these by distributing the supply we currently have on hand. Israelis working in mall kiosks that sell Dead Sea products is a growing phenomenon involving more and more young people who have just finished their conscripted IDF term. Many travel to South Asia and South America, and now, many are coming to the United States to earn more money in a shorter period of time than they could in Israel. It is a situation in which these are mostly taken advantage of by the companies who employ them, and many are illegally working on tourist visas . . . it is what it is. For us, however, it is a unique opportunity to get a copy of the Hebrew Scriptures into their hands and utilize the witness of a Gentile believer's love and appreciation for the Jewish people. Last Fall, I drove 13,000 miles in five weeks, up to Alaska and back, and was able to comb around 40 malls, encountering more Israelis than expected. Many copies of the Hebrew Bible went out. Last Fall, this young Israeli was thrilled to receive a free copy of the Hebrew Bible and a Hebrew New Testament while working at a mall kiosk in Edmonton, Alberta. On Sunday afternoon, I will be hitting the colportage trail again, this time out to California and back, and with the goal of distributing as many copies of the printed Word as possible, "to the Jew first and also to the Gentile." For the first week, Eric and Mindy Trent, will be traveling with me for training purposes. I will be rendezvousing with my wife in Las Vegas and traveling with her for 11 days. I also look forward to connecting with some believers and churches who support this work and to recruiting for next summer's Team Yeshua. Your prayers are greatly appreciated. Pray that the God of Israel puts Jewish people into our path and that we will be faithful to give attention to opportunities with Gentiles as well. I have a small supply of English Bibles, some of them old Bibles from people's bookshelves, that I would like to be able to distribute as well, to Gentiles along the way who do not have a copy of the printed Word. Stay tuned for testimonies from the road! Like the colporters of old, the goal is to freely distribute as many copies of the printed Word of God as possible. In mid-November, Lord willing, I will be taking Eric Trent to South Asia to help him get his feet wet before he and his wife move over there next year. We hope to visit both Ldkh and Kathmandu at the end of the Israeli tourist season and to spend a little time encouraging both of our national partners, Brother Husen and Brother Bishnu. I have to get some Project Jagerna material printed while in Kathmandu, and an important objective will be to train Brother Bishnu and the Nepali believers from his church plant on how to host weekly Shabbat meals for the Israeli tourists as a means to extend the Great Commission vision of these brothers and sisters in Christ beyond their own people. Bishnu has expressed a strong desire to become involved in reaching the Israelis who come to his country. I am excited to be a part of facilitating this. 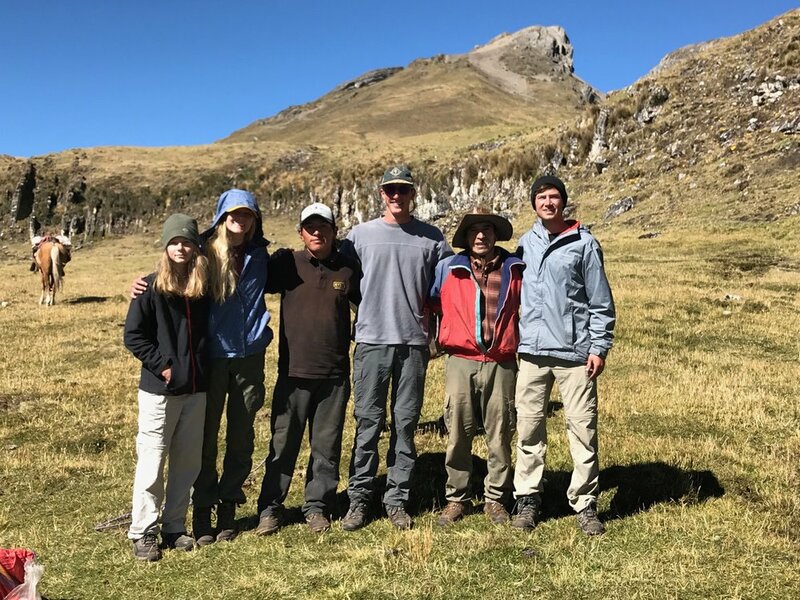 At the end of the year, the Trents, our new laborers, will be heading to Argentina for the big Israeli tourist season there (January - April). My family and I will be joining them for 3 months as we labor together to distribute as many copies of the Hebrew Scriptures as possible and help prepare them for the work they will be leading in South Asia from June until December. The Lord is opening many doors, and time is short. The days are dark, but in Great Commission opportunity can truly be found the best of cheer. I remember witnessing to these two Israeli soldiers in Argentina back in 2010. That's John 3:16 in Hebrew on my shirt. It will be great to dive back into this extremely southern part of the world again next year. I cannot sign off in these September days without briefly reflecting back on the great success that was Team Yeshua Peru, our summer's best of weather. It was out of this experience that the developments described above took root. Back in July, I posted an entry from Huaraz right in the thick of it. You can read that HERE. From that point, we continued to stay busy, and the time truly finished strong. 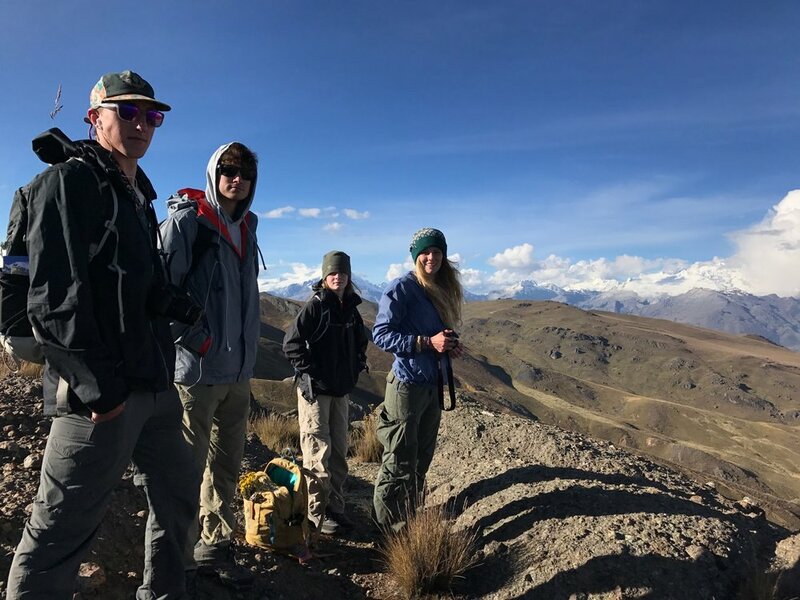 The team combed many of the popular trail areas in the vicinity of Huaraz: Laguna 69, Lago Wliacocha, Laguna Churup, Pastoruri, Laguna LLaca, Callan Punta, Hatun Machay, Punta Olimpica, etc. And, we did quite a bit of hiking and climbing in Huascaran National Park. We met many people along the trails, both Jews and Gentiles, and were able to distribute a good amount of Gospel tracts and Scripture portions. We shared coffee with this young man from the Philippines and his Croatian girlfriend. 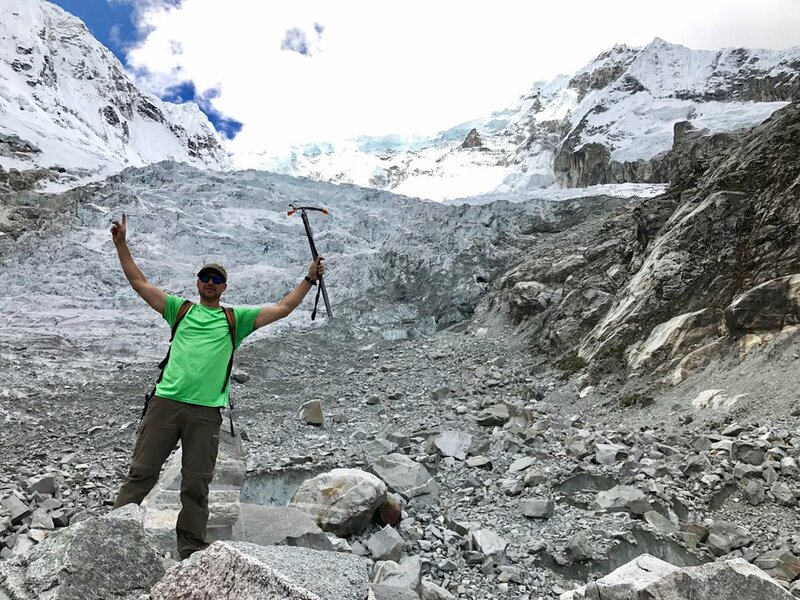 By the end of the summer, all of us were in great shape, having climbed 21 Andean peaks and/or high passes, most of which were over 15,000 ft. in elevation. These strange trees are only found in Peru. Snow is falling on the summit of Pastoruri Torre (16,683 ft.). It's a long way down from the top of Pulgar Rojo (16,339 ft.). In Huaraz, we put up Hebrew signs at a few of the popular coffee shops, inviting Israelis over to our apartment on Friday evenings for a free Sabbath meal "hosted by Americans who love and support Israel." On two different Fridays, two young men showed up. Prior to the meal, we would conduct a traditional Jewish service for welcoming in the Shabbat: giving God thanks for rest, the fruit of the vine, and the bread of the earth. During the Kiddush, or the thanksgiving for the fruit of the vine, some traditions will utilize the following statement in Hebrew, especially in situations where no wine or juice is available: "Blessed are you Lord God of the Universe, who made all things through His Word. Amen." We would include this ourselves and then utilize the reference to the Word of God as an opportunity to see what a "Jewish eyewitness" had to say about that Word in the Hebrew New Testament. I would ask one of the Israelis to read from John 1 in Hebrew, and then one of us would follow up in English. A bit later, while passing around the Chalah bread (Alexis & Bethany did a great job making the bread this year and cooking the meals), I would usually ask if I could read something from one of the Prophets. Then, I would have one of the Israelis read Isaiah 53 aloud in Hebrew; and one of us would follow up by reading in English. This inevitably opened up good conversations about Messiah that would then transfer to the dinner table where we enjoyed a great meal. At the end of the night, I would offer our guests a copy of the Hebrew Scriptures to carry with them on their journey. A Hebrew Invitation for Free Weekly Shabbat Meals was posted at Cafe Andino in Huaraz. The first two young men who came very gratefully received Hebrew New Testaments. The other two who came a following Friday evening took copies of the Tanakh (i.e. Hebrew Bible or Old Testament). We had a lot of fun with the Shabbat meals, and the four who came were very grateful and went away with their spirits shaken to the core. I have actually stayed in touch with two of these young men via WhatsApp. Just the other day, one of them wrote to me from Bolivia: "Keep supporting the Holy Land and the coming of Messiah. It is warming to my heart." At another point during the summer, we invited a couple of Israelis over for the meal that week, and they expressed regret that they would be leaving town before. However, what they said next was interesting: "Someone told us about going to one of these meals at your house. They told us it was an incredible Shabbat." Praise the Lord. I look forward to training Brother Bishnu how to host these meals when I travel to Nepal in November. It's a great way to show kindness and be a witness to the Jewish people. Our Israeli friend reads from John 1 in the Hebrew New Testament. Around Huaraz, we also got to do some open-air preaching in the plazas and distribute a lot of Gospel material up and down the streets. By summers end, Team Yeshua had given out 7,000 Spanish Gospel tracts. The Peruvian Independence Day (July 28) brought a lot of people to town and out into the streets. 'Twas a great opportunity to evangelize the locals. The Lord blessed our team by connecting us with a solid local church and good brethren there who helped us from time to time with logistics. It was a blessing to worship with the folks at Iglesia Biblica Gracia y Verdad on several occasions an to be able to share with them the last Sunday about the importance of Jewish missions as at least a part of a local church's Great Commission vision. I encouraged these brethren to make an effort to reach the Israelis who come to their town every summer for trekking. It was nice to see this body of believers regularly involved in local evangelism and to be able to join them on the streets. The Lord is always good to put solid believers into our path when we travel the world for the Word of God and the Testimony of Jesus the Messiah. Jay preaches in Plaza de Armas in Huaraz; Jesse translates his exhortation into Spanish. 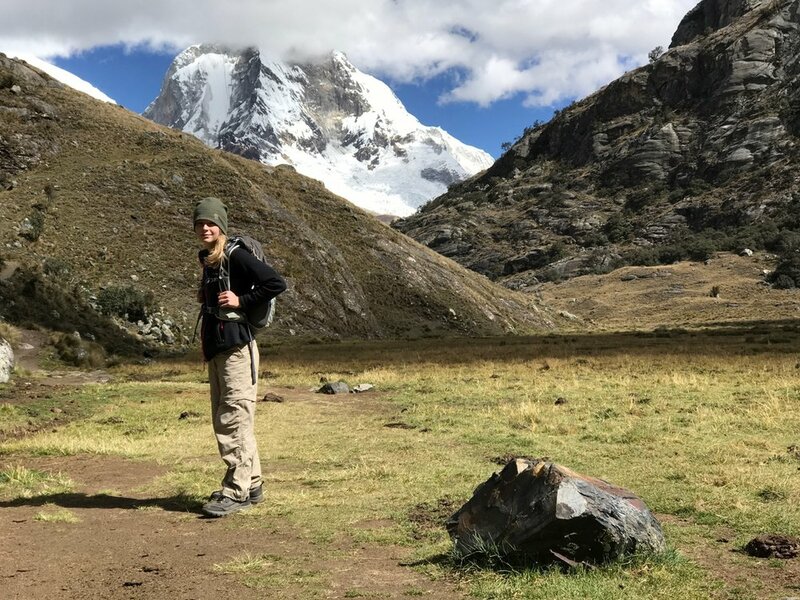 The highlight of Team Yeshua Peru had to be the 8-day, 80-mile trek we did in the Cordillera Huayhuash, a complete circumnavigation of an Andean massif. It was especially brutal because we walked in reverse of the normal route (more more step uphill) so as to maximize encounters with different groups of trekkers. Our expedition included 6 mules, two horses, an arrerio (i.e. mule driver) and a cocinero (i.e. cook). Nearly the entire time was spent above 14,000 ft. in elevation, and we had to cross ten high passes, one of them over 16,000 ft. and the rest within striking distance of that threshold. It was a slogfest grande, to say the least. Yet, hearkening back to the aforementioned poem by Helen Hunt Jackson, the Lord was very good to give us "summer's best of weather," quite literally. 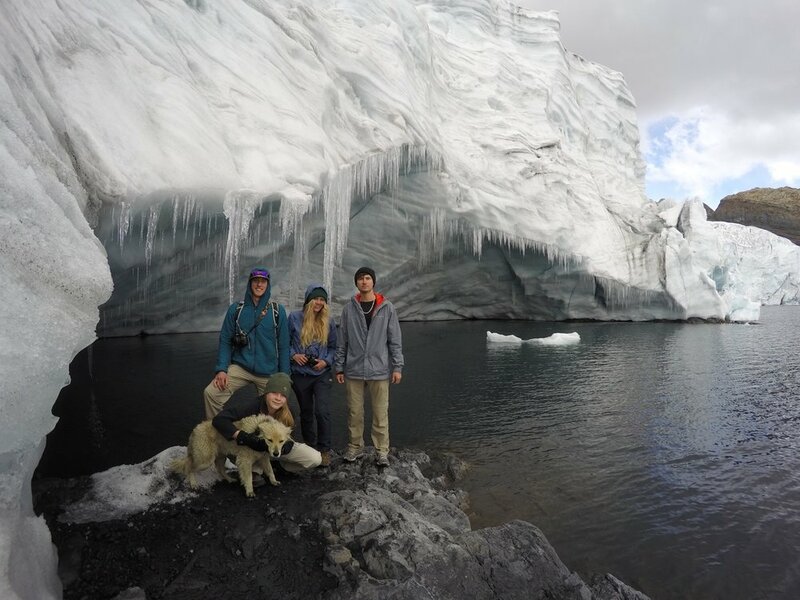 Oh, it was cold in the Huayhuash, no doubt (our summer is winter in South America), but it was dry and gorgeous. 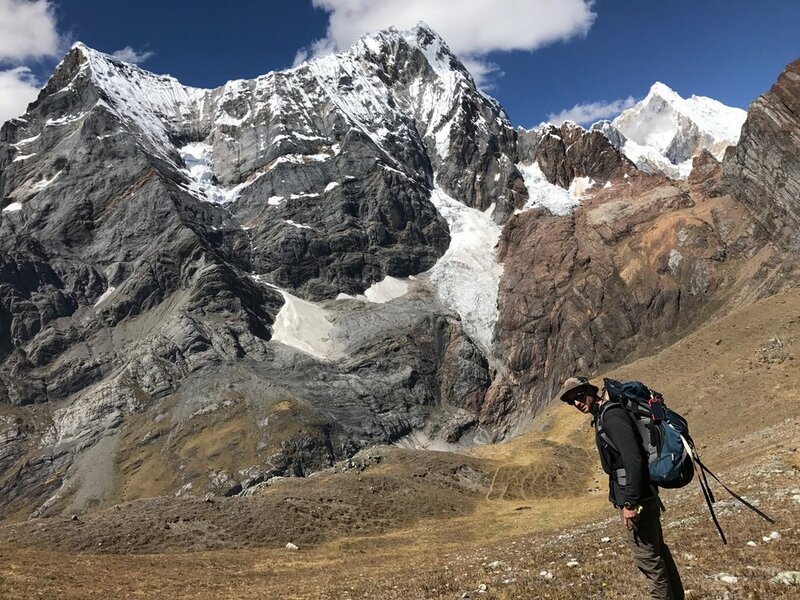 There were a few clouds at the outset of the trek, but then came days of blue sky hovering over snow clad Andean giants without a cloud to be seen. We got to spend good time with Jones, our cook, and Crack, our mule driver, speaking often of the Gospel. Jones even helped by telling the locals we encountered to make sure they got Spanish tracts from us. In the end, they took Scripture portions along with a well-deserved and hefty tip for their great service. The first day was all uphill. Jones whipped up some tasty trailside lunches. It was fresh trout for dinner from the lake outside the tent door. Jones & Crack pack up camp on cold mornings. More important than any of this, however, were the encounters we had along the way with locals, Gentiles from a plethora of nations, and 50-60 different Israelis. Many of our Trekker Gospel Tracts went out, in both Hebrew and English, and the pen drives containing the Scriptures in Hebrew, Spanish, AND English were a huge hit with the Israelis. We only had 10, just wanted to test them out, but we could have easily given away 50! One young lady from Israel asked, "Is the New Testament on here in Hebrew?" I said, "Of course." She replied, "I will keep this pen drive with me on every trek. Thank you so much." Late one evening, after a long slog and while trying to reach a high camp below the Punta Cuyoc pass, we stumbled upon a single tent partially hidden in a cleft of a rock. There was one young man inside, trekking alone. As it turned out, Danny was from Israel and was greatly encouraged by our love for the Jewish people. He gratefully accepted a tract and one of those pen drives. Before we hiked on, he gave me a big old bear hug. 'Twas a true divine appointment. I have stayed in touch with Danny since, and I believe he is now in Colombia. I have an open invitation to stay in his home the next time I am in Israel. On the other side of Punta Cuyoc, the highest pass on the route, is a really sweet natural hot springs with two big cement pools and locals who have portaged up cokes and snacks from a village 2-3 hours below. This place sits in a remote valley and is a true gem after five long days on the trail. At the springs, we actually ran into the two young men who came to our first Shabbat meal back in Huaraz; they were trekking with a larger group of Israelis. They came over to our dining tent for some Israeli coffee, and I mentioned that we had left a message for their group on top of Punta Cuyoc, urging them to be on the lookout the next day as they crossed over the pass. We had taken rocks and spelled out "Jesus is the Messiah" in large Hebrew letters right there by the trail, and beside it, we had placed some Hebrew Scripture portions containing passages about Messiah. There is no way that group of Israeli trekkers missed it the next afternoon. A group of Israelis head out from camp after receiving pen drives containing the Scriptures. This hot springs was a true blessing on a very cold morning. As the shadows grew long on our last evening, we were pushing to get over the Carhuac Pass so as to avoid having to cross two high passes on the last day. We thought we had seen the last of the day's trekkers when, surprisingly, a big group of Israelis walked by. While the rest of the team was talking to them and giving them Hebrew Gospel tracts, I decided to engage their Peruvian guide in Spanish. I asked him if all of his clients in the big group were Israelis. He replied, "Yes, and them Jews are devils." Astonished, I asked: "Why would you say such a thing?" He answered, "It was the Jews who killed Christ." I then lit into this man, declaring in his language that no one killed Christ, that He laid His life down and could have easily saved Himself by calling down legions of angels. I warned him to be careful about despising a people to whom belong the Old Testament promises, for whom the Gospel went first, and by whom the Gentiles received the Word of God. The conversation then turned to Catholic Jesus versus Bible Jesus. I kept thinking he would get angry with me, for I was pretty blunt. But, he didn't. He asked some good questions and was very humble. In the end, he walked away convicted and with a Gospel tract. It was another divine appointment. Oh, I almost forgot. It was the second day of the trek, and the route for that day was long, involved climbing two passes over 16,000 ft. Just below the first pass, after I had witnessed to a girl from India, I ran into an older man from the Czech Republic who lives in California. The guys up ahead of me had already given him a tract. We talked for a few minutes about the state of things in America and the stupidity of American sheeple who cannot see the wicked liberal Communism that has infiltrated our government and society. Having come out of Eastern Europe during the Cold War, he knew all too well about the evils of Communism. Stan admitted he was searching for Truth and had been dabbling around with transcendental meditation. I spoke of the Absolute Truth that is the Word of God and asked if he had a Bible. He did not and very gratefully took a small English Testament, promising to read it. I then prayed for him before we parted ways. We corresponded a bit via email after that. It was another divine appointment. Please pray for Stan. The Huayhuash Trek was great and ended on a very appropriate note from the Lord! At the road, we waited for a couple of hours for the van to show up that would transport us back to Huaraz, a five-hour ride. When it finally did arrive, it was full of people, a large trekking group that would be starting their trek where we had finished (Remember, we walked this thing in reverse of the normal route). They were all Israelis, and we got to share with them and offer them some reading material for the long nights in camp. The conversation I had with a young man from Jerusalem was very interesting, and he was open to hear about Messiah and His salvation, a last divine appointment to cap off eight days of divine appointment. That makes twice now that I have trekked the Huayhuash; and both times, many Jews and Gentiles heard the Gospel! We look forward to targeting this circuit again with a future Team Yeshua. By summers end, the summer's best of weather for Team Yeshua was that many Jewish people and Gentiles from 33 different countries were confronted with Jesus the Messiah and the Word of God. This included North Korea, Montenegro, and Croatia. To God be the glory! When we finally arrived back to North Carolina, each team member shared a brief testimony at a closing service conducted at New Testament Christian Fellowship in Claremont. I had asked that each of them elaborate upon a memorable witnessing encounter from the summer. Kyle Stengel spoke of a young Israeli named Gil that he met and conversed with extensively in a hostel. Toward the end of their conversation, Gil said, "Your knowledge and understanding about our (i.e. Israel's) God and our Scriptures makes me jealous." It was Romans 10:19 and 11:11 fulfilled literally and right before our eyes. Jay Lems hearkened back to an encounter he had with an Israeli couple at that same hostel sometime later. He had shown from the Old Testament how there could be no atonement for sin without a blood sacrifice and then asked these two how their sins could possibly be forgiven since the blood sacrifices ended in AD 70 with the destruction of the Second Temple. Jay then showed them the prophecy about a "New Testament" in Jeremiah 31:31 and explained how the New Testament is the fulfillment of this promise and how Yeshua Ha'Messiach was the ultimate blood sacrifice who made atonement for sin in a way that the blood of bulls and goats could never do. He then offered them a printed Hebrew copy of the fulfillment of Jeremiah 31:31, and they gladly received it. Alexis Lane shared about the multiple conversations she had with a Catholic young lady from Huaraz who worked at the California Cafe. This young woman never could get past her good works, but Allie remained faithful with the message. She emphasized an important truth: "Faithfulness to the message is what makes any witnessing encounter a success, whether or not the person listens." All three of these young people had served on a previous Team Yeshua in Ladakh. I marveled throughout the summer as I watched them put into practice all the things they had been taught back then. It was also a huge blessing to have my daughter Bethany as a part of this team. She was a trooper who handed out a lot of tracts, cooked a lot of great meals, and showed real maturity and leadership in the Gospel work. It was an incredible adventure to share with her. And so, By all these lovely tokens, September days are here . . . There's much work to be done, and the time is short. Please consider supporting this work with more than your prayers. There are needs, and Jewish missions has regrettably been neglected by the Gentile churches in these last days. It should be, it must be, at least a small part of our Great Commission vision. All contributions to Full Proof Gospel Ministries / Zerayim Colportage Board are tax-deductible and will go toward distributing the printed Word and boldly testifying the Gospel of the Jewish Messiah to the Jewish people FIRST and also to the Gentile nations. For more information on how to contribute online, visit HERE. Well, I have to go pack. A long colportage circuit across America and back begins in less than 48 hours. Stay tuned.